M. Maness (2015). Presentation for the Centre for Transport Studies Seminar Series at University College London, UK. Understanding the determinants of activities and travel is critical for transportation policymakers, planners, and engineers to design and manage transportation systems. These sociotechnical systems, and their externalities, are interwoven with social systems in communities, cities, regions, and societies. But discrete choice models – the predominant modelling tool for researching travel behaviour and planning transportation systems – are grounded in theories of individual decision-making. This talk provides a review and discussion of how discrete choice models incorporate social influence with specific application in travel behaviour. The motivations for and mechanisms of social influence typically are not emphasized in existing models which has implications on behavioural dynamics in forecasting models. Additionally, the challenges of collecting data for social influence studies are presented and the talk concludes with a look at the challenges in the field and areas for future research. M. Maness (2014). Presentation at a Choice Modelling Centre seminar event, University of Leeds, UK. This talk provides a review and discussion of how social networks are incorporated into discrete choice models of social interactions with specific application in travel behavior. The talk emphasizes the link between the context of decisions and social interactions to the social networks chosen for the analysis. This social network data is usually obtained through choice-data inference, qualitative study, surveys and experiment, or through stochastic network models. The talk then includes challenges for collecting data for social interactions studies and areas for future research. The talk concludes concludes with a look at two studies of social interactions: (1) a look at weak ties versus strong ties in activity participation using social network data from a name generator and position generator and (2) an examination of informational conformity in bicycle ownership using choice-data inference from US National Household Travel Survey data. M. Maness (2013). Invited Talk at the Start School Later seminar held at Montgomery College on March 9, 2013. In this talk, various transportation solutions to aid in changing the start time of high school students were considered for the Montgomery County Public School System. The talk was framed around the goals and constraints of the various stakeholders: students, parents/guardians, school staff, and bus system operators. 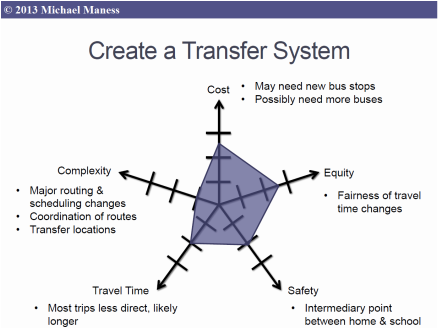 Supply side and demand side solutions were analyzed on the metrics of cost, equity, complexity, mobility, and safety.